William Morrow Paperbacks, 9780062388599, 464pp. From the author of Jerusalem Maiden comes a mesmerizing, thought-provoking novel that tells the riveting story of an American woman—the daughter of Holocaust survivors—who travels to Russia shortly after the fall of communism, and finds herself embroiled in a perilous mafia conspiracy that could irrevocably destroy her life. Inspired by the women she meets, Brooke becomes committed to helping them investigate the crime that threatens their businesses. 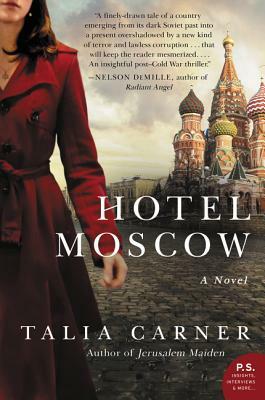 But as the uprising of the Russian parliament against President Boris Yeltsin turns Moscow into a volatile war zone, Brooke will find that her involvement comes at a high cost. For in a city where “capitalism” is still a dirty word, where neighbors spy on neighbors and the new economy is in the hands of a few dangerous men, nothing Brooke does goes unnoticed—and a mistake in her past may now compromise her future. Talia Carner is the former publisher of Savvy Woman magazine and a lecturer at international women's economic forums. This is her fifth novel.